Although I love hamantaschen for Purim, I do think Italy’s Jews have a pretty fabulous take on the tradition of filled foods for the holiday. Their approach? Buricche, or puff pastry turnovers. As the name implies, these are related to the boreka, a turnover of Turkish origin that is now a popular throughout Israel. Cultures all over the world have variations on the turnover, and I always find them delicious. So this seemed like a great canvas for me to work with for a new Purim treat. The Italians often make their pastries with a savory or pumpkin filling. But for Purim, which arrives close to spring after perhaps we’ve grown a little tired of the winter squashes (or anything winter, for that matter) and which often calls for the exchange of sweet treats, my imagination conjured a sweet version. Maybe even a little decadent, in keeping with the holiday’s festive, slightly over-the-top spirit. The filling could start out simply enough with golden dried figs, a fruit native to and beloved in the Mediterranean region. Figs happen to be the first fruit specifically mentioned in the Bible, and one of seven species described in the Bible as important to the land of Israel. 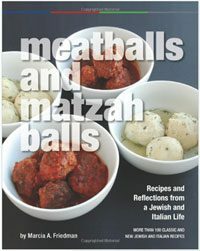 Although I wasn’t necessarily thinking about this when I chose them (I was thinking, figs would make a good filling), I love the choice even more given their age-old connection to Jewish life. Wine is of course integrated into Jewish observance, but at Purim, it’s a blessing or mitzvah to drink (a generous amount of!) wine. I took that as my license to simmer the figs, along with cinnamon, nutmeg, and honey (another of the seven species, by the way) with a good dose of cognac. The thick sweet liquid that develops in the pan during the cooking is seriously good stuff. Hold that thought. I also wanted an Italian ingredient in my filling, plus some creaminess to balance the flavors of fig and spices. Mascarpone fit the bill—smooth, rich, and slightly sweet. There’s something else about traditional foods for Purim, many of which are filled—those hidden fillings are sometimes thought to represent the secrets and surprises in the Purim story (in which Esther foils a plot by the King’s adviser to kill all the Jews in ancient Persia). My pastries tasted pretty good as they were, but they needed more of a surprise—and it turns out a little nugget of good-quality chocolate melting out when you take a bite made the filling just right in every way. Remember, I’m thinking decadent. If you are not with me on this, you can certainly omit the chocolate. Finally, about those pan juices from cooking the figs. Combined with a little powdered sugar and another splash of cognac, they turn intoa fragrant glaze for drizzling over the top of the warm pastries. Since these pastries are best enjoyed warm and they are quite rich, I kept this batch pretty small so you and your family or guests have a fighting chance of finishing it all off. And there you have it—my sweet Jewish-Italian love letter to Purim, signed, sealed, and delivered in its own flaky package. Happy Purim, and happy baking! When it’s decadence you’re after, look no further than these puff pastry turnovers filled with naturally sweet fruit and rich mascarpone. 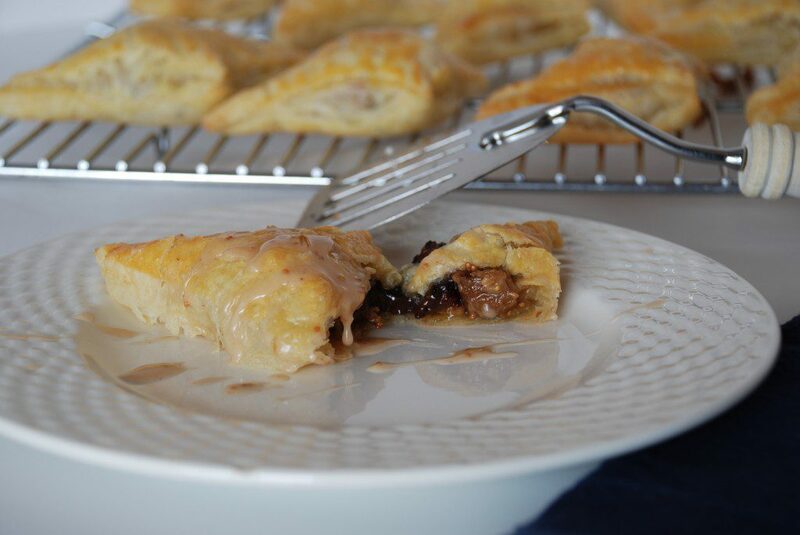 Riffing on the traditional Jewish-Italian buricche for the holiday of Purim, these pastries feature figs simmered in cognac as well as spices and, well, what could more decadent than a melted bite of chocolate right in the middle? The cooking liquid from the figs spiked with a little more cognac makes for a fine glaze on these pastries. You can, of course, omit the chocolate and glaze if you want to tone it down a notch. No matter what, best served warm. Start puff pastry thawing according to the package directions. Preheat the oven to 400 degrees, and line a baking sheet with parchment paper and set aside. Combine the figs, cognac or brandy, honey, cinnamon stick halves, and nutmeg in a small saucepan. Bring to a simmer and cook, stirring occasionally, until most of the liquid is absorbed, about 5 minutes. Set aside to cool to room temperature. Remove and discard cinnamon stick halves. In a small bowl, combine the mascarpone and cornstarch. Stir in the figs, leaving any liquid behind in the pan and setting it aside. Unfold the puff pastry dough on a lightly floured surface, and roll to a 14 x 10 rectangle. Cut into 12 squares. Place a scant 1 tablespoonful of filling in the middle of each square, and, if using chocolate, lightly press one chocolate piece into the middle of the filling. Brush the edges of the square with the beaten egg, and fold the dough over the filling to make a triangle. Pinch ends firmly and use the tines of a fork to crimp the edges to seal. Transfer to prepared baking sheet. Lightly brush the pastry tops with beaten egg. Bake for 15 to 18 minutes, until golden brown. Remove to a wire rack to cool slightly. While the pastries bake, make the glaze by adding the cognac and vanilla to the remaining fig mixture juices in the pan, and stir to combine. Place the confectioners’ sugar in a small bowl and stir in this liquid slowly just until the mixture becomes smooth enough to drizzle. If more liquid is needed, mix in water a few drops at a time. When the pastries have cooled slightly, lightly drizzle the glaze over top and serve them warm. The filling stays very hot for awhile, so be careful.